I haven’t been deliberately ignoring The Amazing Race; it’s just that there are too many shows, too little time. Gone are the times when TAR was my # 1 – with blindsides on Survivor and some drama even on Project Runway (not to mention some gorgeous clothes! ), who has time for that “let’s all be nice and play well together” type of fun that became so common (and so boring ) on TAR? 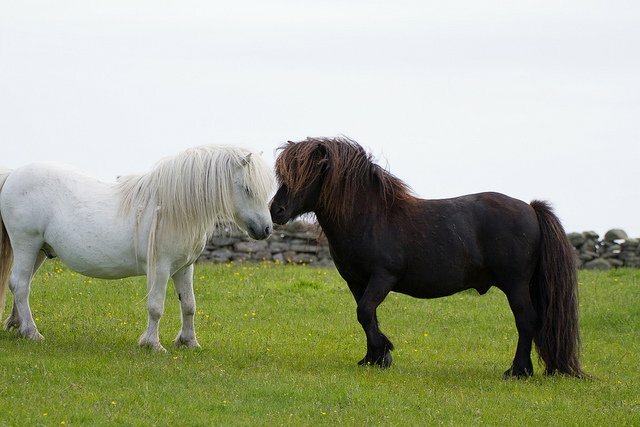 But then – purely by chance – I caught a glimpse of Shetland ponies in a preview to TAR 25 episode 3…There were sheep, too. And animals on TAR are always irresistible and fun to watch (which you cannot say too often of the contestants). And that’s how – thanks to the ponies! – I got finally caught up on the current season of TAR. I actually liked the first episode a lot. It was nice to have a different startline for a change – in NYC, surrounded by fans (not in some guarded location in LA or the vicinity). It was also nice to see an homage to TAR 1 by featuring its finish line in the first episode of TAR 25. A new feature is introduced – “Save” – the team that has it can save itself from elimination if it comes in the last place. Did TAR “borrow” it from Project Runway where “Tim Gunn’s save” has been a feature for a couple of seasons? Either way – it seems more valuable than previous incentives. But the most delightful for me personally was the Roadblock in the US Virgin Islands where the contestants had to find treasure chests using a traditional liquid compass and shovel with 1-yard markings. Finally, finally! Such a rarity nowadays on TAR! – the contestants’ mental abilities are put to test!!! Finally! And of course – the majority struggles. Delightfully so. You don’t really need to know how this compass work, but if you have reasonable intelligence and minimal knowledge – it’s not too hard to figure it out. But then I hear one of the blonde sisters (presented to us as most successful real estate agents in Miami!) proclaiming that “the sun rises in the north and sets in the east“…and – what can I say? I don’t even bother shaking my head or rolling my eyes. But I made sure I learned the name of the only person who figured out the compass quickly and all on his own – Jim-the-dentist (a side note here: you don’t really need to be a dentist or even have a college degree for that matter to figure it out). We had a little deja vu, too – much like in the first leg of TAR 22, several teams chose to take 4-hour penalties rather than finish the compass task. Tsk-tsk-tsk!. Anyway, Jim-the-dentist along with his wife Misti-the-dentist got to the Pit Stop ahead of everybody and earned the coveted “Save“. The blonde “most successful real estate agents in Miami” got eliminated . Not a huge surprise but hugely satisfying. Leg 2 was far less fun. The teams fly to the United Kingdom and then it’s a hodgepodge of Queen’s Guards, pancakes, London, Oxford, boats, bowler hats, umbrellas…The leg was hard to follow and not that interesting to begin with. There was a little twist that allowed teams to make a little detour in search of the Express Pass, but since the first team – surfers Bethany and Adam – were safely ahead of the other teams, they could afford the luxury of spending time in search of the Express Pass. They got both – the Express Pass and the first place in this leg of the Race. Now I hear some rumors in social media, suggesting that the Express Pass thing was “rigged”/”tailored”/”designed” specifically to be found by handicapped Bethany and her sidekick husband, that ” it would improve her chances to complete (or bypass) future Roadblocks“. I truly hope it’s not the case. I would despise it if it were the case. 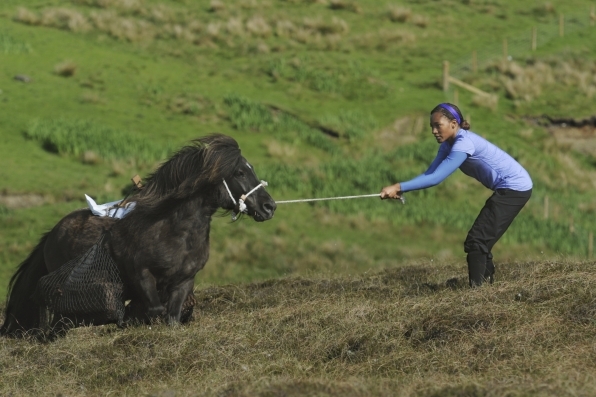 “the Shetland Islands are known for the Shetland Pony“. No kidding! Who would have thought! It’s bad enough TAR has a penchant for choosing some rather ignorant contestants, but please don’t dumb down the show any further. The stars of this leg were definitely the ponies – cute, diminutive, intelligent yet capricious. I know Detours that involve animals can become unpredictable and sometimes disastrous, but I personally would never have considered making a torch (the other alternative of this Detour) if I could get a chance to be close to the ponies. But ponies were not the only animals in this Leg of the Race. There were Shetland Sheepdogs – well, the cameo appearance of one real Shetland Sheepdog and the teams’ impersonation of the rest. There were flocks of sheep that our contestants had to corral. There was even a minor mystery clue to the Pit Stop. Nothing that would overheat the contestants’ brain (practically everybody got the answer right with the help of locals), but at least the directions were not spelled out. Good. Once again – Jim-the-dentist and Misti-the-dentist were the first team at the Pit Stop. Next team that stands out to me is Bethany and Adam, the surfers. For obvious reasons – she has only one arm (the other one she lost to a shark). So of course she is noticeable. 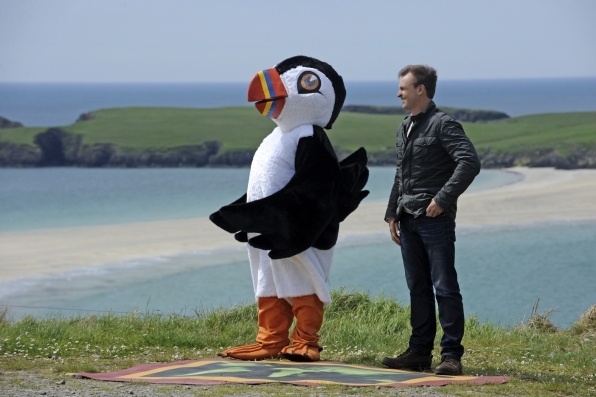 But she comes across as artificially childish (“Ohh, can we play with the Puffin?” “Ohh, can I go for a swim?”) rather than genuinely exuberant and excitable (like Mallory Ervin – remember her?). She is quite bland even though she has an unusual story (which she worked into various book deals, movie deals, endorsement deals and what not). Her sidekick husband is largely invisible – even after 3 episodes I wouldn’t be able to pick him from a lineup even if my life depended on it. I don’t mind them though, but only because they pick my curiosity – how would she do in Roadblocks with one hand? So far she hasn’t done a Roadblock, but the talk in social media is that “they’ll tailor a Roadblock to her“. I hope not. But when people ask “so why there were no Roadblocks in Episode 3 but 2 Detours instead?” – it makes me wonder. Why indeed? It also makes me wonder – does she have priority boarding as a handicapped person? Do people go an extra step in helping her seeing that she has only one arm? The step they would not make for the others? All this would be very commendable in real life, but on TAR – everybody should be equal, no special treatments. Well, we shall see. Another team that stands out to me is mother/daughter Shelley and Nici. Mostly because they look like sisters rather than mother and daughter. But also because they seem full of life and sound very genuine when they talk about being real fans of the show. I somehow doubt though that they would go far. The rest of the remaining cast is sort of a blur – two pretty interchangeable female teams (one team is the cyclists, another – the food scientists), a cute (but nothing more) college sweethearts team, a team of ex-Survivors (were pretty much invisible then and are pretty much invisible now) and a team of pro-wrestlers. The pro-wrestlers are walking stereotypes of their profession – both a he and a she appear overly muscular, overly tattooed and not overly bright. The appearances can be deceiving of course, but they have not yet managed to deceive by the end of the Episode 3. This entry was posted in Episode Recaps, General and tagged adam and bethany, Adam Dirks, Alli Forsythe, Amazing Race, amy and maya, Amy DeJong, Bethany Hamilton, Brooke Adams, brooke and robbie, cast, CBS, dennis and isabelle, Dennis Hour and Isabelle Du, Detour, Express Pass, keith and whitney, Keith Tollefson, kym and alli, Kym Perfetto, lisa and michelle, Lisa Thomson and Michelle Thomson, Maya Warren, michael and scott, Michael Ward and Scott Strazzullo, misti and jim, Misti Raman and James (Jim) Raman, Phil Keoghan, Pit Stop, reality TV, Robert "Robbie E" Strauss, Save, shelley and nici, Shelley Porter and Nici Porter, Soul surfers, TAR 25, Te Jay McGrath, television, The Amazing Race, The Amazing Race cast, The Amazing Race production, the amazing race season 25, tim and te jay, Timothy "Tim" Tsao, TV news, Whitney Duncan. Bookmark the permalink. Food for thought def that surfers have it easy so far. Detour and roadblock this past leg used both teammates even though normally only one does roadblocks. Making it easy on Bethany perhaps? Also someone pointed out that the cars were automatic. In case Bethany cannot drive and shift with one hand? Don’t know if it’s true, but if yes it’ll be awfully unfair. Agreed.